All the members of a family are entered separately then linked to one of the parents. The people in a group or committee are linked to the leader. People being sponsored are linked to the sponsor. 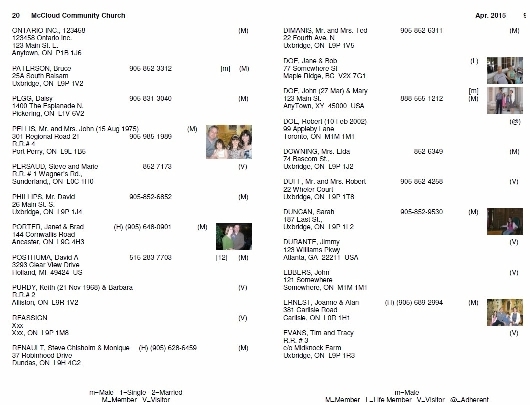 This makes it easy to create a color photo directory showing each person in the family, and a family or individual picture. You can do one copy of the photo directory using the demo version of Donarius®. Show which donors have a birthday in the next week so you can send them a card. Also can send an anniversary card for couples who will be having their anniversary soon. For synagogues: send Yahrtzeit letters a few weeks before the anniversary of a loved one's passing away.